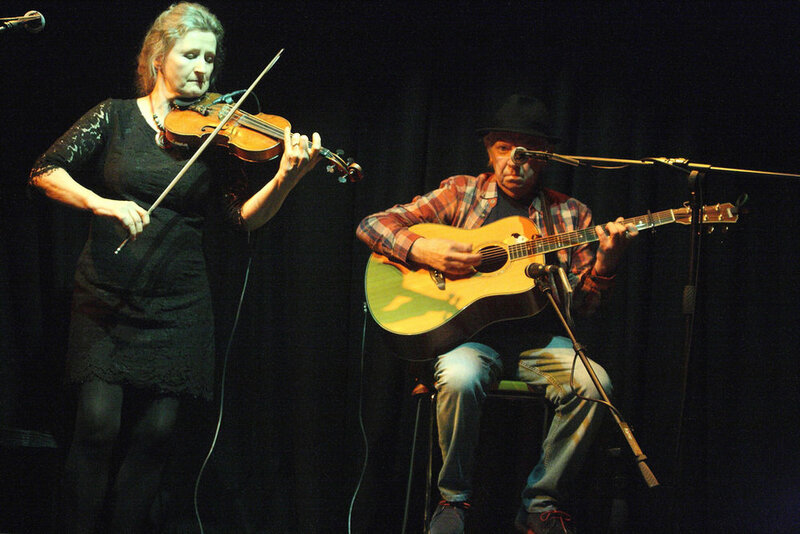 Nollaig Casey and Arty McGlynn are a most exciting duo who together provide a rich mix of talent and experience. Nollaig and Arty first met in Dublin in 1979, after which their musical paths crossed again and again at recording sessions, television and radio studios and on stage with Andy Irvine, Planxty, Makem & Clancy and Maura O'Connell. The more they played together the more they enjoyed each other's company and eventually in 1984 they married. Arty is without doubt the finest and most sought after guitar player in Ireland with a unique understanding of music he performs. Born in Omagh, Co. Tyrone, is family were steeped in traditional music, but when his mother bought him his first guitar at the age of eleven, it was the great jazz guitar masters that he studied, and by the age of fifteen, he was already playing professionally. His first solo album, "McGlynn's Fancy", was released in 1979 to great critical acclaim. This is the first recording ever in which the guitar is played in an authentic traditional style, and as such has been hailed as a classic in the traditional music world. Arty subsequently became one of the most sought after musicians in the country, playing and recording with the likes of Christy Moore, Paul Brady and Liam O'Flynn. He played as a member of such prestigious groups as Planxty, Patrick Street, De Danann and The Van Morrison Band. Nollaig is one of Ireland's most gifted musicians, with an international reputation as an exponent of Irish traditional music on the fiddle. By the time she began to play the violin at the age of eleven she was already proficient in a variety of instruments - notably piano, tin-whistle and uilleann pipes. Throughout her teens she developed her talents both in fields of classical and traditional music, winning several All-Ireland titles for fiddle-playing and traditional singing culminating in the award to her in 1972 for the best all-round performer. Having graduated from University College of Cork with a B-Mus degree at the early age of nineteen, she embarked upon a professional career, firstly with the RTE Symphony Orchestra where she remained for five years and later as a freelance player of growing stature. She joined the legendary band Planxty in 1980 and toured with them in Ireland, UK and Europe. In recent years Nollaig has recorded and toured with a variety of groups and musicians including, Moving Hearts, Liam O'Flynn, Mary Black and Elvis Costello. Her television appearances include the BBC TV series "Bringing it All Back Home" and "A River of Sound". Nollaig has also performed as a featured artist in Donal Lunny's Coolfin band with whom she has recorded and toured extensively. More recently She has performed as a soloist with the phenomenally successful 'Riverdance' as well as featuring in Shaun Davey's 'Granuaile' and 'May We Never Have To Say Goodbye' which was the theme song of the Special Olympic World Games 2003 which was hosted by Ireland. Don’t miss the chance to hear the legendary Arty McGlynn and Nollaig Casey live in concert in the intimate setting of Matt Molloy’s Yard Bar. Doors open at 8pm and tickets will be available on the door.